Every once in a while I get an email asking where to find the text and music of the Devotion to Saints Dominic and Francis traditionally sung during the thanksgiving after the main meal on those saints' respective feasts. There is a old tradition of Dominicans inviting the local the Franciscans to dinner on the Feast of St. Dominic and the Franciscans inviting the local Dominicans on the Feast of St. Francis, and this chant was part of those festivities. So this text is also known to Franciscans. I remember hearing it back when I was a novice back in the 1970s, but could never find a copy. A couple days ago, I was looking for a chant in the Processionarium S.O.P. and there it was in the appendix! So I made up a version that can be downloaded here. The text is actually an antiphon: Seraphicus Pater Franciscus et Apostolicus Pater Dominicus: ipsi nos docuerunt legem tuam, Domine. ("Seraphic Father Francis and Apostolic Father Dominic: they taught us your law, O Lord. "), sung with the Psalm 117 and a Gloria Patri. The music is simply the Dominican Rite Psalm Tone VI. So it is not at all hard to learn. 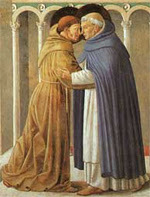 When the chant is sung on the Feast of St. Francis (at the Franciscan house), St. Dominic is named first. St. Dominic's feast is coming up next month (August 4 in the traditional calendar, August 8 in the new calender), so this good time to make this chant available.